Dahkla & Mut For Budget Backpackers: Let's Stop In For A "Shai"
After our trip backpacking through the incredible deserts near Bahariya, we continued on to yet another beautiful desert oasis called Dahkla, a budget backpacker’s haven. Boarding the bus in Bahariya we were looking forward to a relatively quick 6 hour bus ride over to Dahkla. But, as in most Egyptian bus journeys, it ended up being a bit longer for a total of 9 hours. When buses go longer than expected and don’t stop anywhere but at snack shops, we often end up running on breakfast until late at night. Dariece can handle it but I tend to get a little grumpy if I haven’t eaten every few hours so by the time we finally got to the town of Mut, Dahkla, I was tired and hungry and couldn’t wait to get a room. Luckily the bus driver was very nice and dropped us off right in front of the hotel we were planning to stay in. We were greeted at the hotel much the way we are greeted everywhere in Egypt, like family. 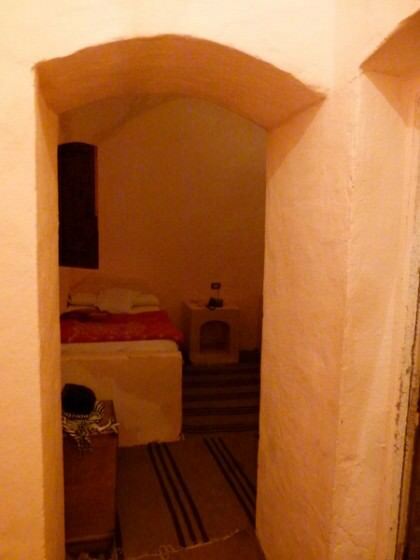 A young man named Muhammed showed me a couple of rooms, one a regular, basic, hotel style room with three small beds and a bathroom in the hallway outside. The other, a very funky mud brick style bungalow that looked like something out of the Flintstones. The shelves, windows, and even the bed frame were all moulded from the same sand coloured mix of mud and salt. This room definitely fell into our backpacker budget. A very cool place. Our really cool room at Dahkla, Egypt. The next day we avoided the friendly hotel staff’s persuasive offers for a tour around the area (a little too touristy for us budget backpackers) and set out on our own to check out the old city of Quasr. The city of Quasr is another ancient desert town completely made from mud. Some people still live within its crumbling walls but the majority have moved into the newer developments in the streets outside the old maze. We didn’t spend too much time in the old town because we have seen quite a few mud villages now, and although they’re all different, they don’t all need days to explore. So we ventured out into the farms that stretch past the main road for miles. 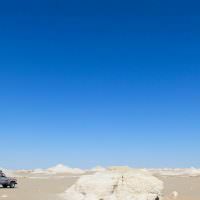 As in many places in Egypt, it doesn’t take much to get off the beaten path. 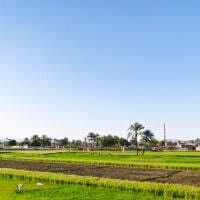 We let ourselves get a little lost in the narrow paths that wind through the beautiful, fertile farmlands around the oasis. We swam in a gorgeous natural hot spring, its only flaw was the giant generator that screeched loudly to produce its emerald water flow. After a dip in the secluded spring we went even further into the farmland, and thus felt like we were going even further back in time. Men crouched down harvesting the various crops that glowed an almost fluorescent green, donkeys hee’d and hawed loudly in displeasure, and tiny spring fed rivers ran through the grass and along the banks splitting the earth into perfect sections with their turquoise glow. 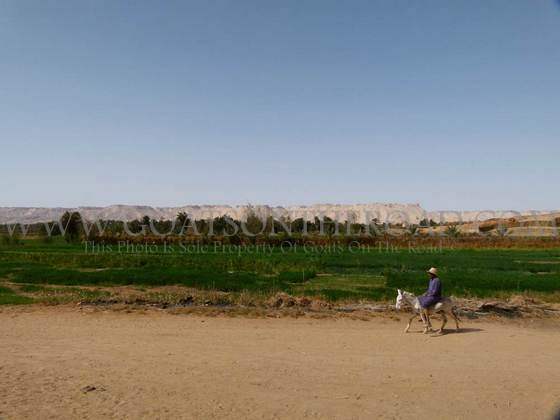 Walking through the farmland around Quasr Village, Egypt. Cooling off in the natural hot springs around Quasr Village, Egypt. 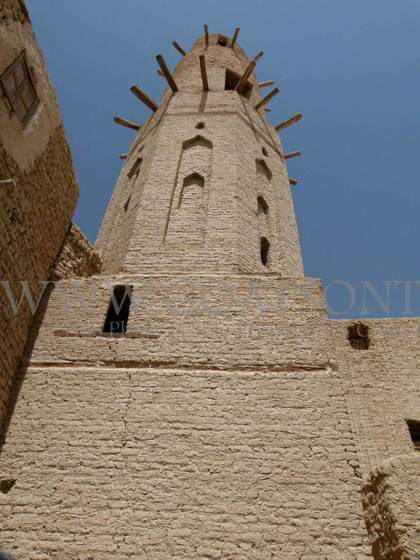 The further we got from the main road in this already secluded town, the further we found ourselves in the real Egypt. The Egypt that has remained, virtually unchanged, for thousands of years. The more we got into the real Egypt, the more awe filled stares we received from the locals. All of which surely only knew the words “hello” or “welcome”, which they yelled out proudly as we walked by. 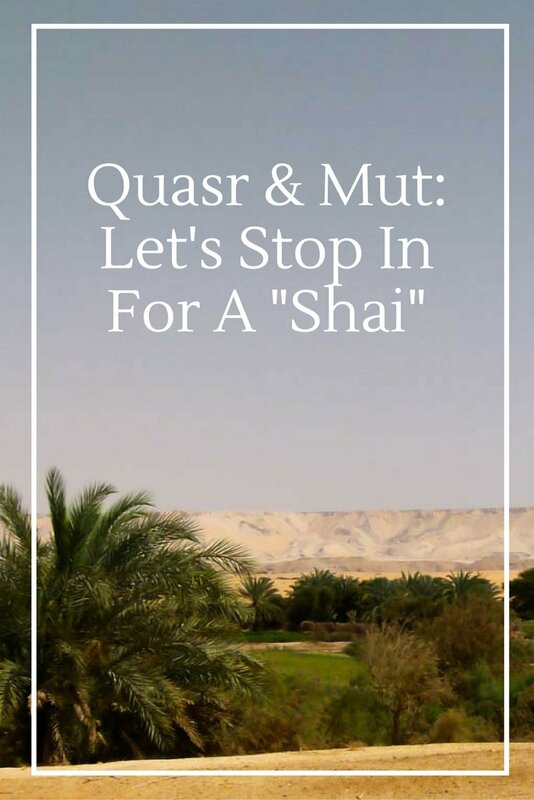 Luckily our Arabic vocabulary is broad enough to know that “shai” means tea and we were offered in to a young farmer’s home to enjoy a cup of his finest. 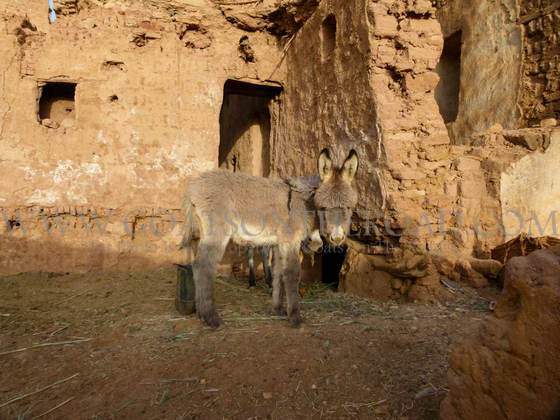 His small hut stood barely taller than me and looked out onto his stunning green mint farm, with a backdrop of the enormous sand and boulder strewn cliffs that surround the area, flanked by the massive sand dunes we have now become so used to. Truly a million dollar view. We crouched down and entered his tiny mud hut, walked through his living/bedroom and into the only other room in his home, the kitchen/dining room. Stopping in for a “shai” with a very friendly Egyptian man. Quasr, Egypt. 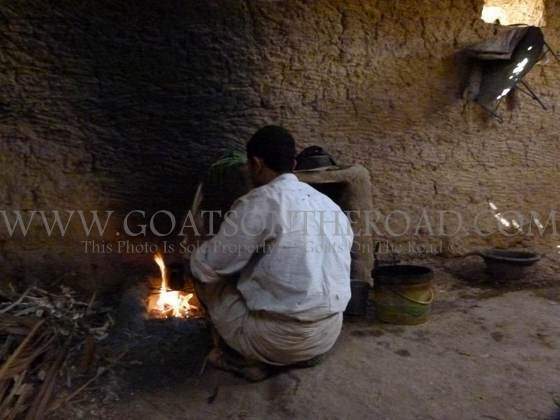 His mud house had no bed, and no furniture. I noticed that blankets were set on the floor of the other room as I sat down on the floor in his kitchen. The only sort of feature in the entire house was a small shelf, made of mud, which held his 4 cups, a couple plates, a bag of tea, and a few utensils. He lit a fire in the corner of the room where he heated up a pot of tea. He knew no English, not even hello or welcome, but we got by on the little Arabic we’ve picked up in our time backpacking through Arabic countries. His name was Muhammed (along with half of the male Egyptian population) he has one wife and one baby girl. He lives in the hut for a few months farming and brings back the money to support his small family. The man has less than perhaps any man I have ever met, and yet he was willing to share with me a cup of the only thing he appeared to have, tea. The tea was finished just as my pathetic attempts at Arabic ran out. We said our goodbyes, and not for one minute did I sense that he wanted anything more than our company. With a big smile he shook my hand and said “Ma’salama”, good-bye. Yet another amazing travel and learning experience I will never forget. The rest of the day we wondered around the farms and enjoyed more tea from the friendly local farmers in the area. Once we felt that we couldn’t bear another glass we headed back to Mut via minibus. As usual the mini bus driver tried to charge us about 5 times the local rate for the ride, but luckily a young Egyptian man from Cairo stood up for us and made sure we paid only 1 pound 25 paisers. About 20 cents. Upon returning to Mut we realised that we weren’t quite where we were supposed to be so Dariece asked a couple of local girls to help us. Unfortunately their English also did not span past hello and welcome so instead they waved us down a taxi. We really just wanted to walk because we were close and are incredibly cheap but because they had already flagged it down we figured we’d hop in and pay the small fee to get us back to our hotel. However when the taxi stopped the young girls pulled out their wallets and proceeded to pay the taxi driver. We argued with the girls that we wanted to pay but they insisted and no matter how hard we tried they wouldn’t take any of the money we held out to them. So, shocked and touched by their generosity, we hopped in the cab and went home. Enjoying the company of some hospitable Egyptian men. Quasr, Egypt. Later that night we were heading out for some tea and sheesha when young Muhammed, the hotel worker, asked if we would mind if he joined us. He spoke very good English and seemed like a really nice kid so we agreed. It’s nice travelling with a local because not only do you get a knowledgeable guide, but you automatically get Egyptian price for everything you buy. Muhammed came to the restaurant and insisted that we not buy him anything there but we did anyways. 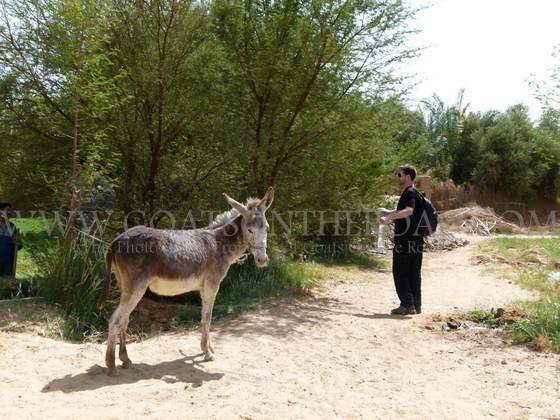 He told us about his family and his lifestyle in the oasis. He would love to one day travel to Canada but for now has to study his English, work, and help support his mother because his father had died unexpectedly. After our chats he walked us back to the hotel, but before we could get there a taxi pulled up and a large, rather sketchy man got out and sauntered towards us. He claimed he had brought tourists here from Luxor and was now about to go back empty so he could give us a good deal. Normally we would immediately ignore him and continue on, but we knew that many taxis came from Luxor with tourists, and inevitably had to go back empty, so they try to get anyone they can for almost any price just to get back to Luxor. He seemed a little shady but after some bargaining we got him down to an incredible price that was very hard to pass up considering it would save us about 12 hours of rough Egyptian bus travel. 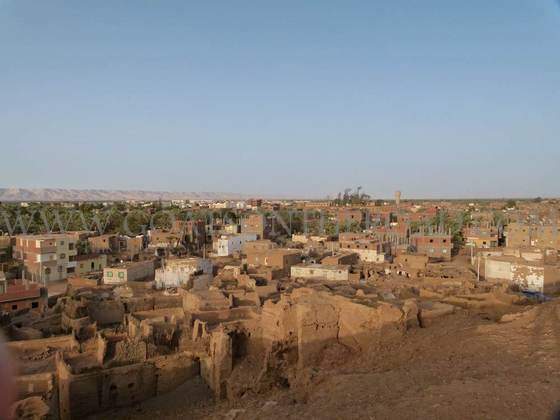 Beautiful view over the mud village of Mut, Dahkla, Egypt. We got in the cab and headed to the bus station to cancel a ticket we had already purchased to get us to Asyut the following day. On the way Muhammed repeatedly looked at us concerned, shaking his head, warning us not to go. He kept saying it was too expensive, but for us it was okay. Nonetheless it gave us a bad feeling so aside from the ticket office being closed we were looking for another sign that this was not a good idea. Alas, the sign from Allah came just a few minutes later when we drove past a tourist couple calmly walking down the sidewalk. We told the driver to stop and the cab came to a screeching halt a few inches from the now weary street walking travellers. Dariece and I, dollar signs gleaming from our eyes, clambered out of the cab and barreled towards the unsuspecting backpackers. “HEY YOU GUYS WANT TO SHARE A CAB? !” we hollered. Just then the cab driver got out to come join our sales pitch when a motorcyclist rammed head on into his now open driver side door, dislodging it from its top hinge. We looked back just as the biker regained control and rolled to the sidewalk clearly injured. As our cab driver apologetically joined the injured man who was now sitting on the sidewalk next to us, we eagerly continued our conversation seemingly unfazed by the collision…probably because of the years of travel experience between us all. The next day we took the bus at 6 am for the long journey to the next town of Asyut,where we were hoping to catch a train right away to Aswan. But as usual it didn’t quite turn out how we planned. Saying good-bye to Dahkla and the amazing/ridiculous experiences we had there, we boarded the bus and continued our journey on to Asyut.